If you are an outgoing person and spend majority of your time outside having fun with your friends or family members and often worry about your iPhone running out of battery, this news will make you a very happy person. A Netherlands-based company has designed a pocket-sized solar charging Dock that is very handy to charge your iPhone while you are away from power outlets. A Netherlands-based A-solar and solar tech company, Intivation unveiled its Solar Power Dock at the Mobile World Congress in Barcelona. The Dock is capable of charging iOS devices including iPhone and iPad, utilizing the solar energy. The Dock is amazingly small enough to fit in your pocket, so you need not to worry about carrying it. The Solar Power Dock features a durable built-in battery, with a small solar panel and strong rubber finishing casing that help it keep devices operational when you are away from power outlet. The Dock is offered with a price tag of $105. At its full capacity, the internal battery stores almost 6,000 mAh, a little more than what your average solar charger stores, such as the Solio. The Dock needs 12 to 16 hours under the sun to make it fully charge that will offer your iPhone with impressive 4-hours of talk time. Interestingly, the Dock is capable of soaking up energy in the cloudy days as well. It is worth noting here that the Solar Power Dock is able enough to charge your iPad up to 60%. The most impressive feature of this Dock is that it can charge other types of phones as well with an integrated USB output. 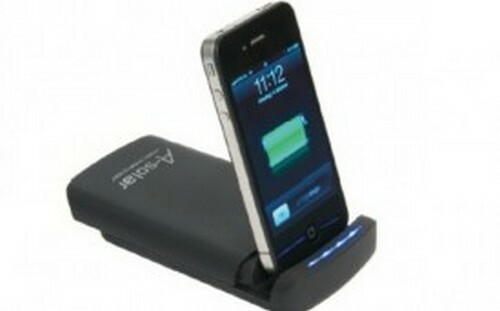 So, if you are not an iPhone user, still you can take benefit of using this dock charge your handsets. Please let us know in the comment section whether you find solar-chargers reliable or you ever got a change to use any solar-powered charger.